Along with the Mayor of Middleburg Heights, Cuyahoga County Engineers decided it was time to replace the deficient 100- year old bridge spanning Baldwin Creek in Cuyahoga County. 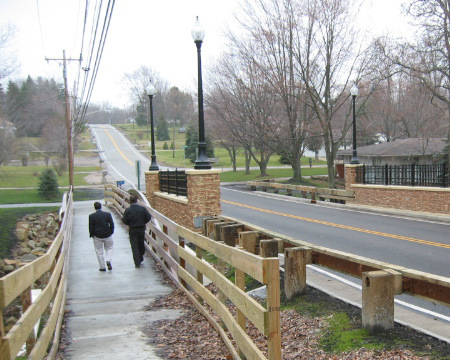 A Continental® pedestrian bridge and a CON/SPAN® vehicular bridge were combined to offer a complete solution to the county and the city. The original proposed structure was a concrete barrier type structure with a pedestrian walkway. However, because the bridge was part of a residential area, the city’s mayor asked for an upgrade. The mayor was able to negotiate for some aesthetic improvements. The CON/SPAN structure provided the aesthetic arch he was hoping for with stamped concrete and a stone look finish. 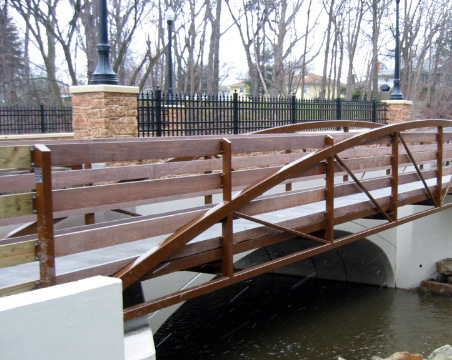 The Keystone® style pedestrian truss bridge has concrete flooring and a painted weathering finish. Decorative metal railings were added to the structure and fluted column light posts were additional aesthetic features. Hundreds of motorists drive over the Webster Road bridge everyday, and residents of the community, cty officials and the county engineer are pleased with the two structures working in conjunction for a safe yet attractive passage over the creek.